Every School has one professor that causes fear and trembling amongst the students. 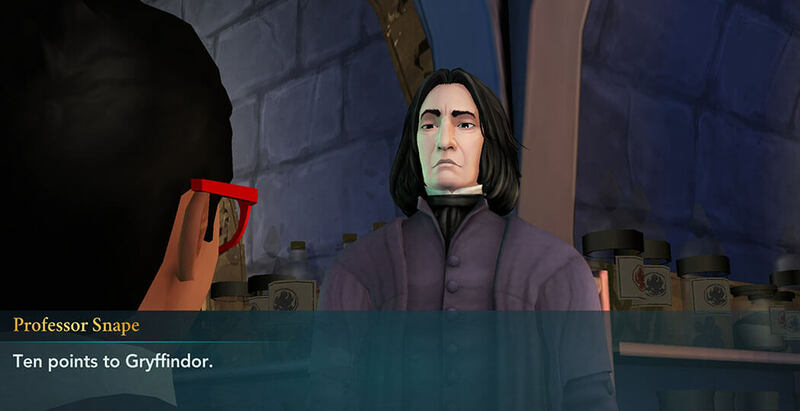 In Harry Potter: Hogwarts Mystery it is definitely Profesor Severus Snape. Severus Snape is a half-blood wizard that teaches Potions and Defense Against the Dark Arts in Hogwarts School of Witchcraft and Wizardry. His first appearance was in the Harry Potter movie franchise. He will have the same exact personality in both the movie and the game. You will notice him with his long black hair wearing a dark purple coat. He is also the Slytherin Headmaster so beware if you end up sorted in Slytherin house and if you break some school rules, you are in for some nasty treats. Even if you want to ask him a simple question you will get the most sarcastic and unpleasant answer there is. If you put aside all the things mentioned above, he is also one of the most skilled wizards in the whole school. The thing is, no person is born grumpy and cruel. 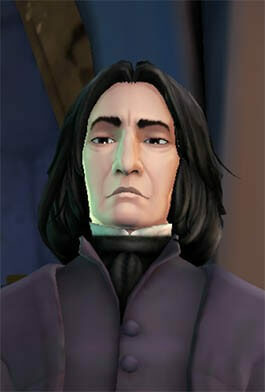 Severus Snape was born in the 1960's where he had a rough time growing up. His mother(Eileen Prince) was a pure-blood while his father was a Muggle, and a bad one. His father was Tobias Snape, he hated magic and he didn't want to have anything with it. He was neglected by his dad, and from there, only hatred occurred as he was growing up. He was also living in a low habitat suburb where everything was always wet and dirty. Every single thing that happened to him, every argument between his parents and the love he never got from them made him who he is today. He couldn't wait to get away to Hogwarts. He attended Hogwarts in 1971. Even when he wanted to be social and friendly he was having a hard time accepting others. His rough childhood made him have a thick skin that no one was able to penetrate. Even in school, he didn't have peace. Always studying and being quiet made him the perfect target for school bullies. But he was an excellent student. While attending other classes he managed to learn new charms and create some of his own. Such a huge talent at a very young age. 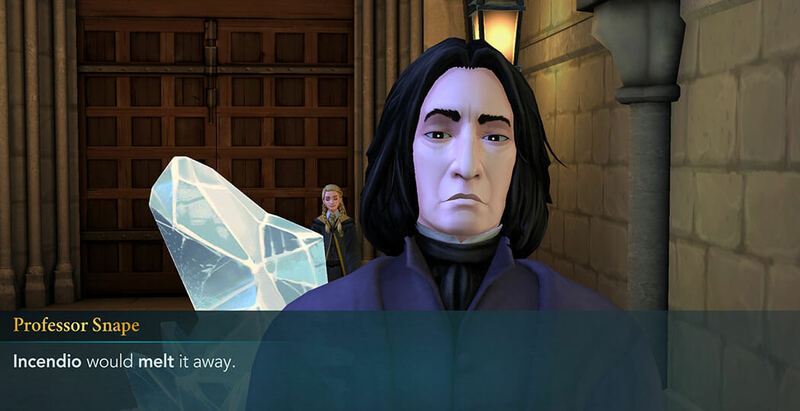 In Harry Potter: Hogwarts Mystery Snape won't bother you much. If you mess something up he will take your house points, but also if you do something good he will award you house points. You will first see him in the Great Hall among other Headmasters at the Sorting Ceremony. Chapter 5: Snape interrupted the unauthorized duel between your protagonist and Merula Snyde that happened in the Courtyard. There he will tell you to meet him after the big mess you've made in the halls of Hogwarts where you will have to face some consequences and lose 20 house points. Chapter 6: In this chapter, your character will sneak up onto Merula Snyde who is silently eavesdropping on Professor Snape and Mr. Filch. There, they will talk about the Cursed Vaults and the secrets that lie there. 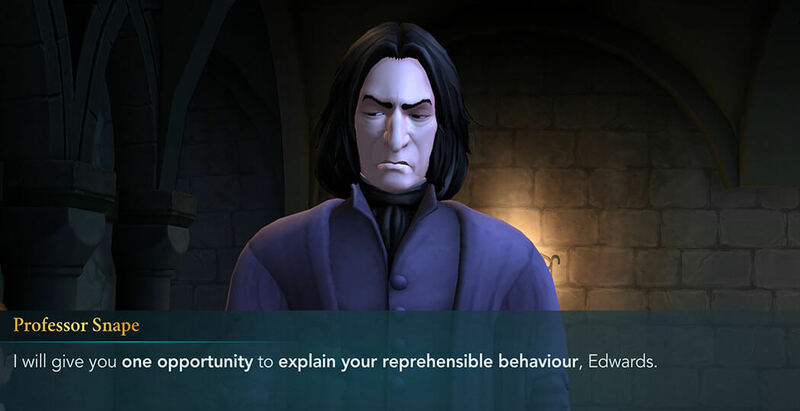 Snape will continue to be his usual grumpy self in year two while striking fear into the hearts of all of the students. Not even Slytherin students will be spared if they mess up. He will still be teaching Potions Class in the second year. Chapter Three: Your plan to retrieve the Black Quill from the Slytherin Common Room went well; or rather it would have gone well had it not been for Professor Snape catching you red-handed as you tried to make your escape. But after hearing your story, he seemed distressed and let you go, which is very odd, especially for him. He seemed particularly concerned when he learned the name of the person who sent you the note, the mysterious R.
Later in the same chapter, you see that Professors McGonagall and Snape have found poor Ben frozen in the Cursed Ice. Snape doesn’t come across as the most considerate person when he suggests that they melt the ice using Incendio, which would also harm Ben. Perhaps this is because Ben is a Gryffindor. 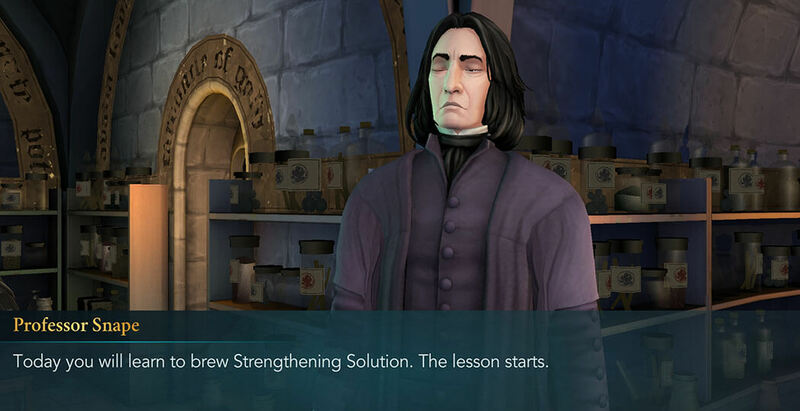 Chapter Five: In Chapter Five Professor Snape will teach you how to brew Strengthening Solution in Potions Class, but only after rigorous practice. He will have you mixing ingredients and stirring cauldrons until you can no longer look at one. Chapter Six: In Chapter Six, there is a side quest from Hagrid to help him gather supplies to make a Fire-Breathing potion. Once you’ve collected all of the ingredients, you will need to use Snape’s classroom to actually brew the potion. And his help of course, since you cannot do it yourself. When Snape asks you why you need it, you should come clean and admit it’s for Hagrid. This will result in Snape giving you 10 House Points, which is uncommon considering you are a Gryffindor.